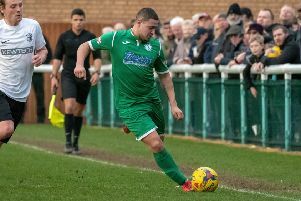 Biggleswade FC slipped to only their third league defeat of the season as Colney Heath came from behind at the break to win 2-1 at Langford Road on Saturday. FC had led early on thanks to a Ryan Inskip strike, but a straight red card for Joe Bradbury just two minutes into the second half and then two quickfire goals from a lively Colney front pairing Chris Blunden and Jack Woods saw the Magpies leave with all the points. FC now trail leaders Tring by nine points - albeit with three games in hand. Ryan Inskip benefited from an element of good fortune to give FC the lead on 17 minutes just a minute later. Lee Northfield found himself in a bit of space centrally and attempted a through pass towards Abraham Eze. The ball hit Eze on the back, but fell invitingly for Ryan Inskip, who strode through and clinically dispatched his 15th goal of the season into the bottom right-hand corner. FC pieced together the move of the match just before the half hour when an intricate build-up involving Coles, Lawrie Marsh, Northfield and then Cookman saw the latter dig out a cross for Eze, who couldn’t quite get over his header at goal. The decisive moments of the match arrived in nine early second half minutes. Joe Bradbury went in for a challenge on the far side of the field. It was difficult to see exactly what unfolded, but the referee sent Bradbury ff for the tackle. Chris Blunden levelled just three minutes later with a potshot on the turn that flew into the net. The turnaround was complete on 56 minutes. Michael Carroll’s pass was intercepted and Jack Woods was soon on his way in behind and the pass was played at exactly the right time to break the offside trap. Tompkins was quick to react, but Woods was able to get there first and guide into the empty net. FC visit North Greenford United on Saturday and host Hadley on Tuesday.